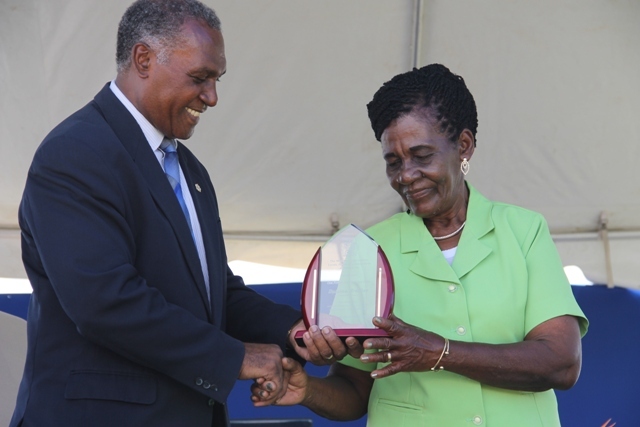 NIA CHARLESTOWN NEVIS (MARCH 17, 2016) — Dulcina Brookes-Byron, a 53-year veteran labourer at the Department of Agriculture on Nevis is the patron for the department’s 22nd Annual Open Day. She was honoured at the Opening Ceremony of the two-day event at the Villa Grounds in Charlestown on March 17, 2016. Premier of Nevis Hon. 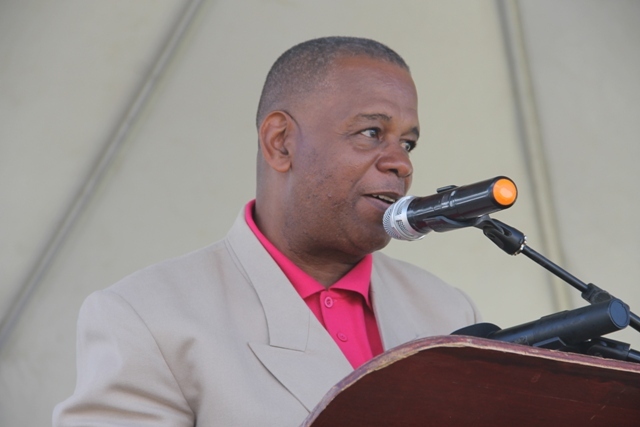 Vance Amory, who stood in for Minister of Agriculture Hon. 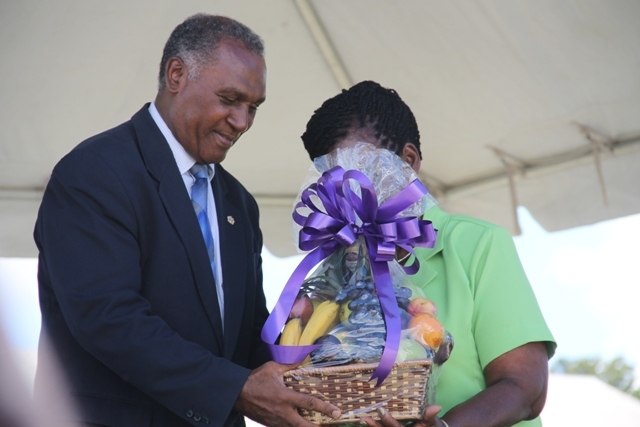 Alexis Jeffers, presented the 2016 Patron with a plaque and a fruit basket on behalf of the Department of Agriculture. Presenting her profile, Permanent Secretary in the Ministry of Agriculture Eric Evelyn said Brookes-Byron is affectionately known as “Molly” and described her continued service as dedicated and committed. He said she began working with the department in 1962 at Low Ground Estate picking castor seeds when she was 20 years old. “When she took up employment in the field of Agriculture, she had to survive on a meagre wage which didn’t see any major increases for a very long time. In her earlier days with the department, she worked hard and left her mark at all the government owned estates – Indian Castle, New River, Eden Browne, Potworks, Cades Bay and Prospect. However, most of her work is concentrated at Prospect where she continues to work. Her duties range from planting, weeding and harvesting crops. She works with all the crops produced by the department including vegetables, root crops and cotton. Mr. Evelyn said she is involved in all aspects of agricultural work there, among them the production of vegetables, root crops, fruit trees and seedlings. She was also described as one who takes pride in her work, is very regular. Mr. Evelyn said Molly who has a quiet demeanour, continues to be respectful to her supervisors, loves her work and has no regrets regarding the 53 years she has spent so far with the department. However, the Permanent Secretary said she is tough and has the ability to handle the hard work involved in the agriculture industry. He quoted Molly as saying she thoroughly enjoys all the years she has spent with the department. Evelyn said the Ministry and the Department of Agriculture Co-operatives and Fisheries is delighted to honour one of their own. He thanked her for her hard work, dedication and contribution to the development of Nevis.